"Alabama is celebrating the 50th anniversary of the Voting Rights Act by making it harder for black people to vote"
Larry Wilmore slammed the state of Alabama on Tuesday evening's Nightly Show for their sketchy closings of DMV offices in traditionally black ares of the state. Claiming "budget cuts," Alabama is closing 31 DMV offices in the state while at the same time requiring that voters have a driver's license or state issued photo ID in order to vote. The 31 offices are primarily located in black and minority communities. "Ok, wait a second," Wilmore said. "To vote in Alabama you need an ID and they're closing the place where you get IDs? Is this just a coincidence or something more?" 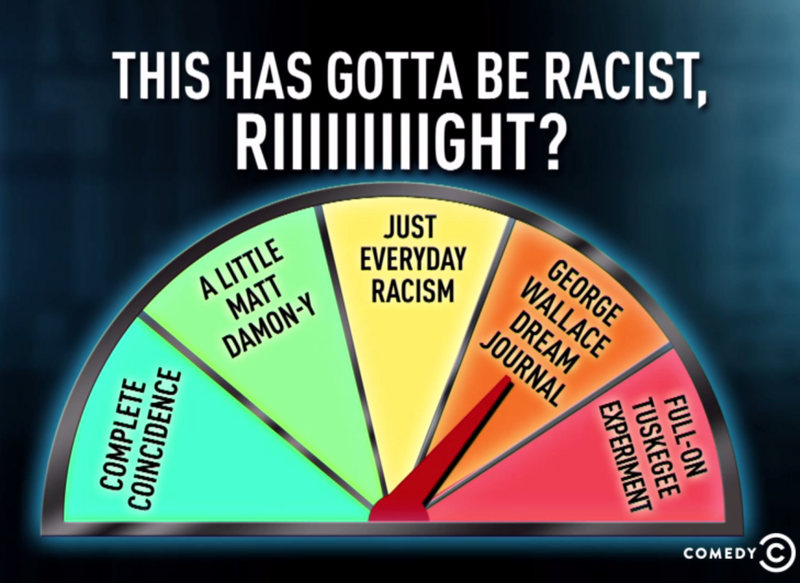 Wilmore refused to overtly call it racist instead deploying the show's new "This Has Gotta Be Racist, RIIIIIIGHT?" meter which rates racistiability of something. This time we got "George Wallace Dream Journal" levels of racism. "Seriously Alabama?" Wilmore asked in his WTF tone. "Look, I know I shouldn't expect much from a state whose flag is the Bars and Stars, but I hoped it was just the stars that were racist. Maybe the bars really did believe in states' rights." Wilmore says that Rep. Terri Sewell has asked for an investigation by the Department of Justice, but a reminder to Wilmore, the Supreme Court said racism doesn't exist anymore. No matter how BS that might sound, it comes from the highest court in the land so it must be true unless "high" has another meaning. "Fun fact though," Wilmore continued. "Selma, Alabama is in Rep. Sewell's district. That's right. Selma, as in the Oprah Winfrey vehicle and to a lesser extent, that march that led to the Voting Rights Act, and now Alabama is celebrating the 50th anniversary of the Voting Rights Act by making it harder for black people to vote. Okay, that is not cray, that is the crème de la cray."